More than 350 million ink and toner cartridges are thrown away every year instead of being recycled, contributing to over 254 million tons of trash produced by Americans each year according to the EPA. Printer cartridges are also a significant investment in resources, from various plastics and metals to inks and toners. These resources are wasted when the cartridges are discarded into landfills. Why add one more cartridge to the landfill? If you have 100 used cartridges, you can send them back to us. Get the details about our bulk collection program by contacting us today. Many manufacturers also have their own ink recycling programs that eventually lead to our products on TomatoInk.com. 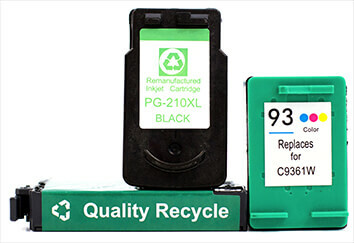 Read the side of your product's box to find out about disposal best practices or keep reading to check out ways to recycle your old toner and ink cartridges. For your used Epson branded inkjet cartridges, ink packs, bags, and bottles, you can package the old cartridges and send to Epson America, Inc.'s Recycling Center. For your AcuLaser CX11N Series cartridges, you can ship using a pre-paid label available on the Epson website. U.S. Environmental Protection Agency, “Advancing Sustainable Materials Management: Facts and Figures,” April 11, 2016. Retrieved June 29, 2016.